Due to the handcrafted nature of these pieces there may be a lead time of 4-6 business days before this item ships. This wood wall art makes a major impact both visually and for how well it’s made. It’s handcrafted in Ohio by a wife and husband team who use locally sourced woods like elm and oak along with reclaimed woods, too. 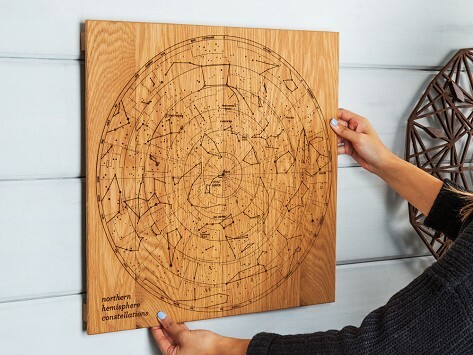 The constellation-themed map is laser-etched to result in a piece that is undeniably eye-catching. Chelsey and Trevor Cain pair their backgrounds in graphic design (her) and woodworking (him) to create their distinctive wood wall art. They start with wood that’s locally sourced within 100 miles of their studio in Ohio from places like old barns, or they use local hardwoods like oak, maple, walnut, and elm. The Cains have a hand in every step of the process, from hand drawing the images that are later laser etched, to milling and building each piece. This move is a deliberate one. The duo wants to maintain control over the quality of their work and keep an eye on all the details. They intend for their work to last for generations, from the construction to the timeless aesthetic.